So we're trying something NEW!!! but I do believe all people are creative. Some do it through gardening or woodworking while others create music or knit or crochet and sew. 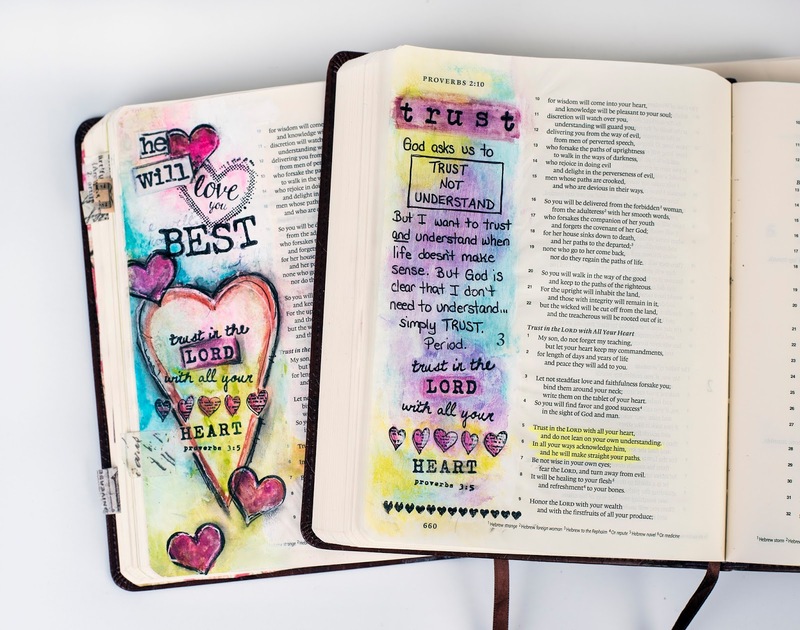 I do photography, home decor and paper crafting and am dabbling in makeup and fashion as well and recently became aware of Bible Art Journaling... creatively portraying lessons from the Bible right inside my Bible (recognize the logo now?). And I'm still passionate about Haiti and helping others so we are presenting an event that celebrates all things CREATIVE and supports some great causes (Haiti, Christy Riopel ART scholarship and Grace Youth summer Missions Trip)!! 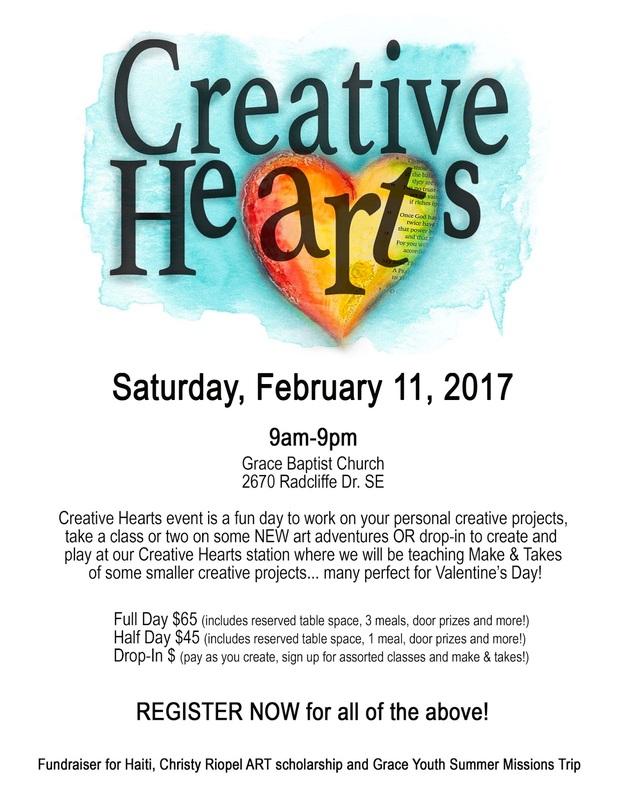 We have partnered with Grace Baptist Women's Ministry and the Grace Youth for a full day of opportunity for you to exercise your creative side... and classes to teach and guide you along in a variety of creative outlets!! 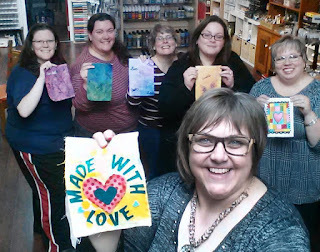 DROP-IN throughout the day to CREATE!! or STAY and CREATE all day!! 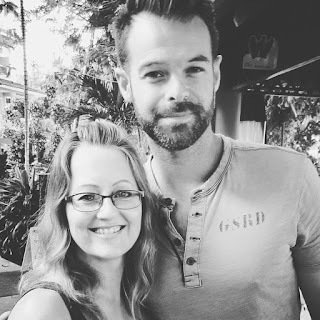 Another dose of grief has come my way... this one different from Christy... but yet I know those close to him have joined the "Grief Club" (see previous post). 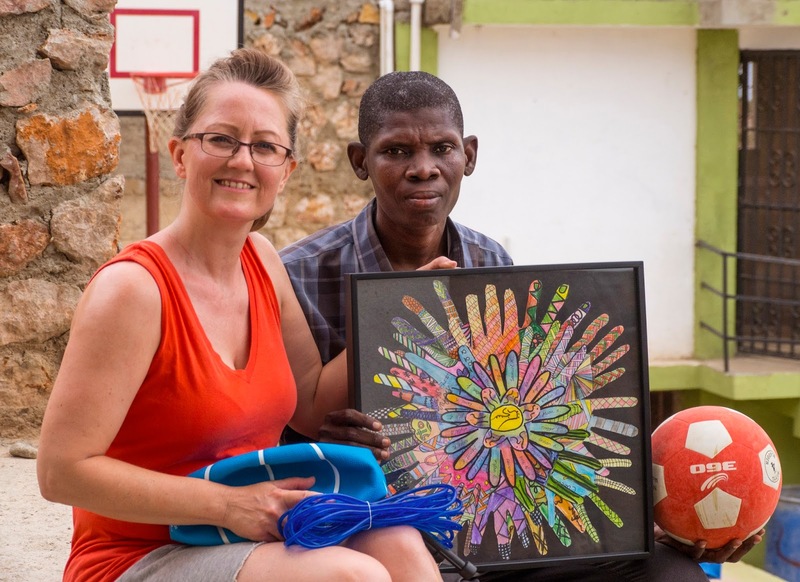 Cole Brown has been our "guy in Haiti" as I have coordinated with him and our Hope for Haiti fundraising efforts here in Canada over the past few years to build an ART room and teach art at the school there. 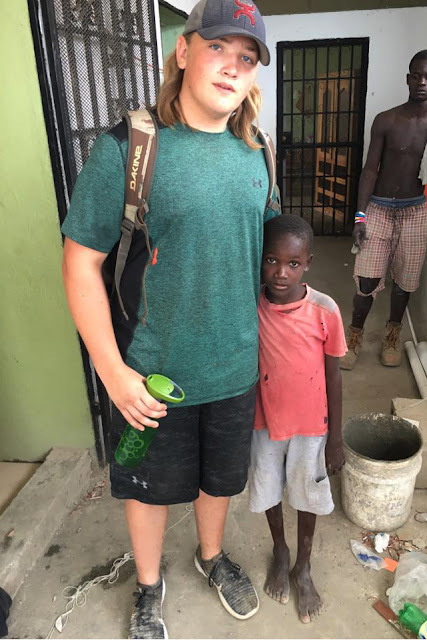 Cole has been living in DR/Haiti for the past 10 years and passed away in a plane crash doing aid work following the recent hurricane in Haiti. 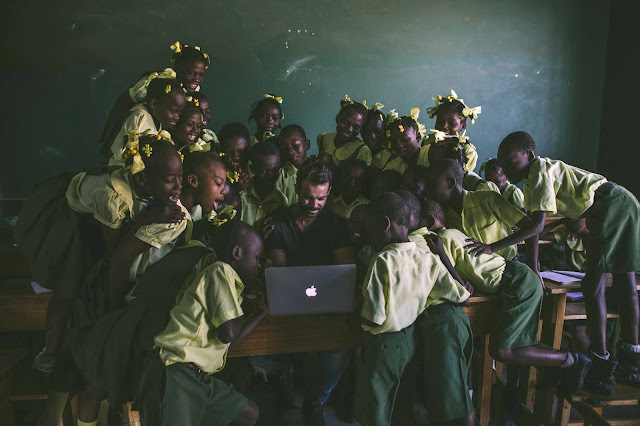 I think you can tell a lot about a person by how children react... and the children in Haiti were a testament to how passionate Cole was about them and helping their school and community. He was also an insanely amazing photographer that I may or may not have been jealous of and wanted to be just like when I grow up!! Life on earth is fleeting. I believe God prompts us in different ways to make the most of it by helping others. 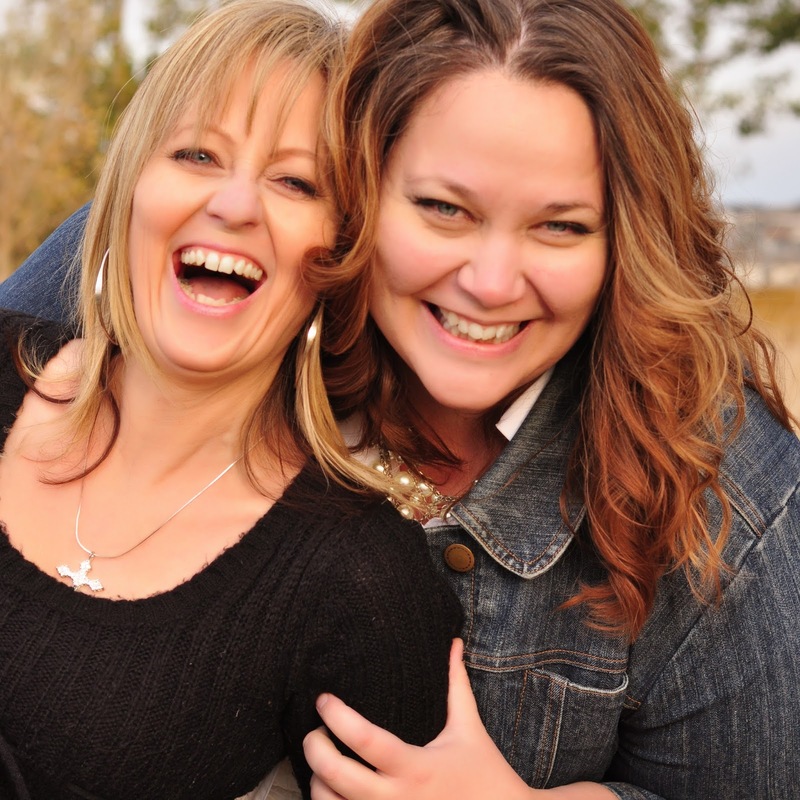 My prayer is that when it is my time, I will hear the words in Heaven, "Well done good and faithful servant." And so that is how I want to live out the rest of my life on earth, however long that may be. I feel like I have joined a secret club... a club I didn't realize existed. Everyone who has lost someone near and dear knows of this secret club... everyone understands that there is nothing you can do about it either... you suddenly join one day and GRIEF has it's way with you... however it wants, whenever it wants and for as long as it wants. Meanwhile, I'm still learning what it means to be a member of the GRIEF club... but this I know... I have a new appreciation for life. 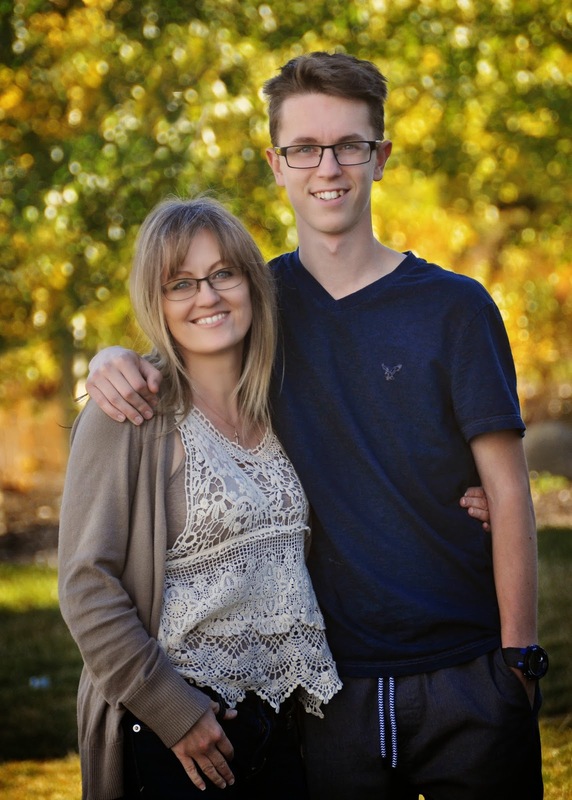 I always thought I already had good perspective on what is truly important, but the loss of Christy has taken it all to a whole new level yet again. I'm not exactly certain what it will all mean... but I'm open and ready to learn. I'm 50 years old and still trying to figure out what I want to do with my life... this I know... it's going to have to be meaningful. PS. 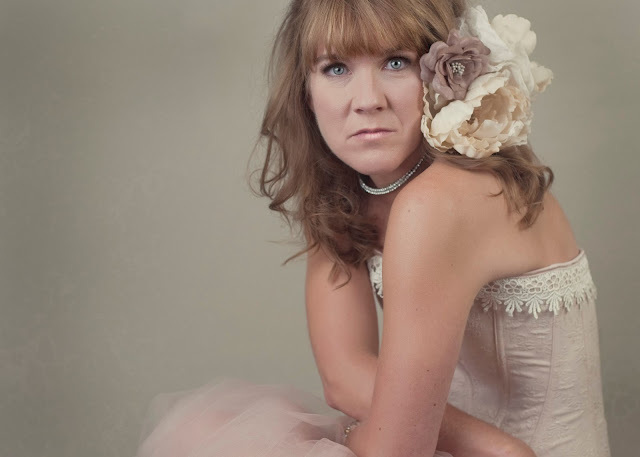 I am sooooo thankful I forced Christy to pose for a few portraits in my studio recently... I always say that one day your photos will be your most valuable possession... and there are never enough of them. Truth. This is a "be still my heart" video from Haiti... we were at the end of our trip and as always, we get to feed the children at the school. 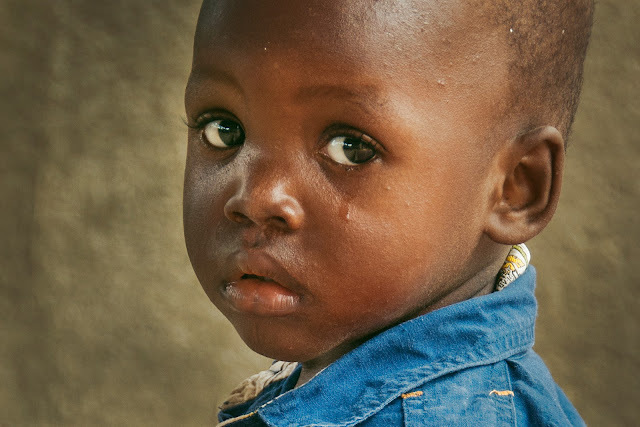 It quickly came to our attention, however, that some of the older children were stealing food from the younger ones... you can't really blame them I guess as when you are that hungry, you resort to a bit of a "survival of the fittest". I still believe that TOGETHER WE CAN DO THIS!!! It's hard to know where to begin!! 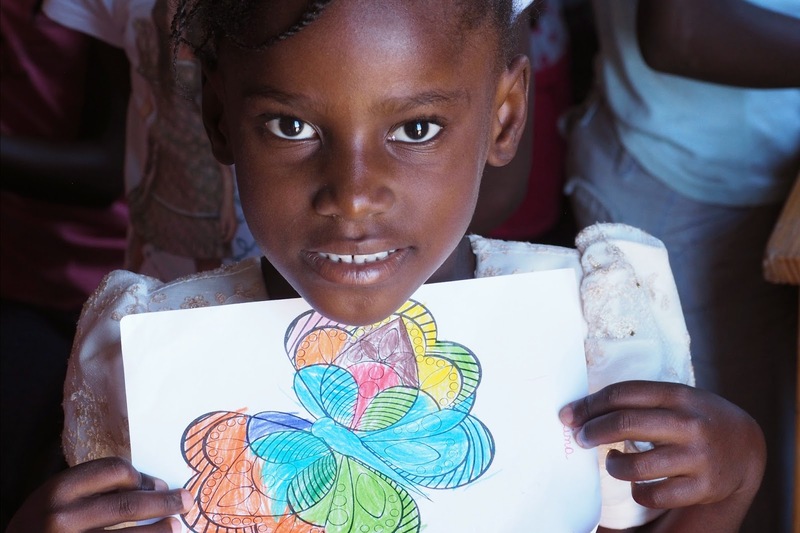 This was my third trip to Haiti to help build the school and teach art and it was probably one of the best yet hardest experiences... the children were again so very happy to see visitors and especially excited about getting to do more ART!!! 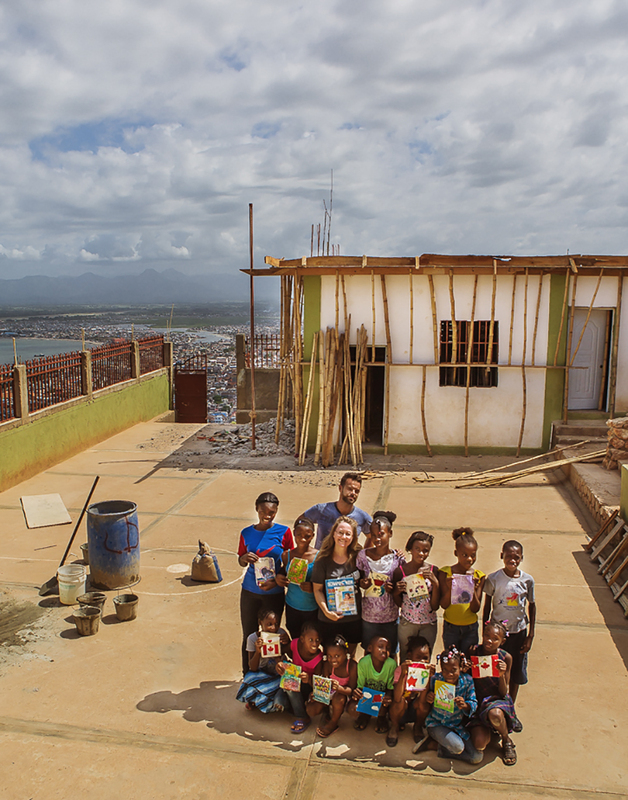 Below you see how they prepared for our arrival and on top of that rooftop is where we began building the new ART ROOM or ART DECK that will have a beautiful view overlooking the city of Cap Haitien below. I got to personally deliver the hundreds of ART banners that Canadian crafters all made to help decorate the new art room!!! I took photos of each one with one of the students holding it so watch for those still coming if YOU are one of the generous souls that donated one!! We will still have to sew them together and deliver the final banner someday, but it's exciting to see them all!! So... guess how old this little boy in red is?!?!?! He comes from a family with a single mom and her 5 boys (the youngest 4 attend the school) and we had the privilege of helping build them a new home!!!! But it was so very hard to see how malnourished they all were... just utterly gut wrenching :( So many of the kids there are in similar situations and it is so very hard to know what to do... but long ago I learned that we help by helping one person, one family, one community, one school... and if everyone does a small part, it can make such a HUGE difference. So much more to still share!!! If you haven't already seen this visual... here are all the locations that held similar Crop for Haiti events across Canada!! I have to say it has been overwhelming for me to see how even complete strangers have joined in our project and I can't say thank you enough!!! 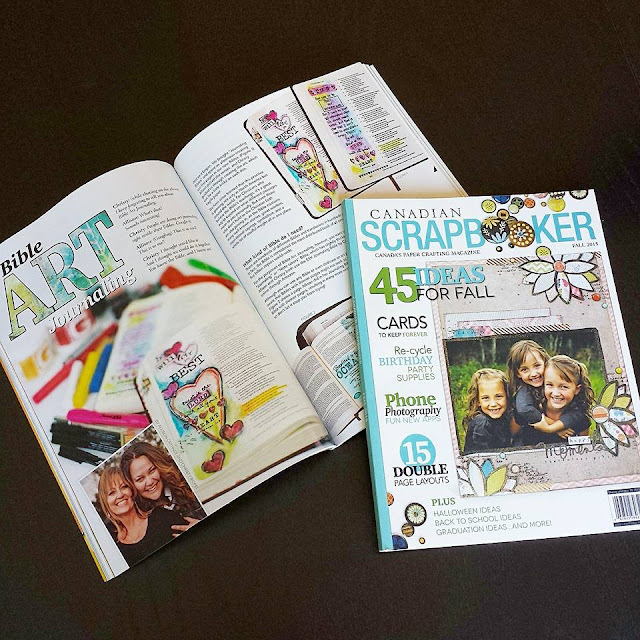 A special thank you to Creative Scrapbooker magazine for partnering with me to help make this happen and for their constant support and encouragement of my big hairy audacious ideas!! 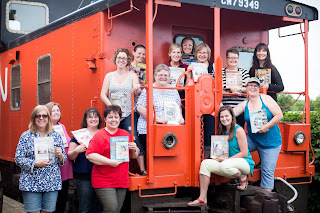 Here are a few group photos from some of the events with more to come! TOGETHER WE CAN DO IT!!! 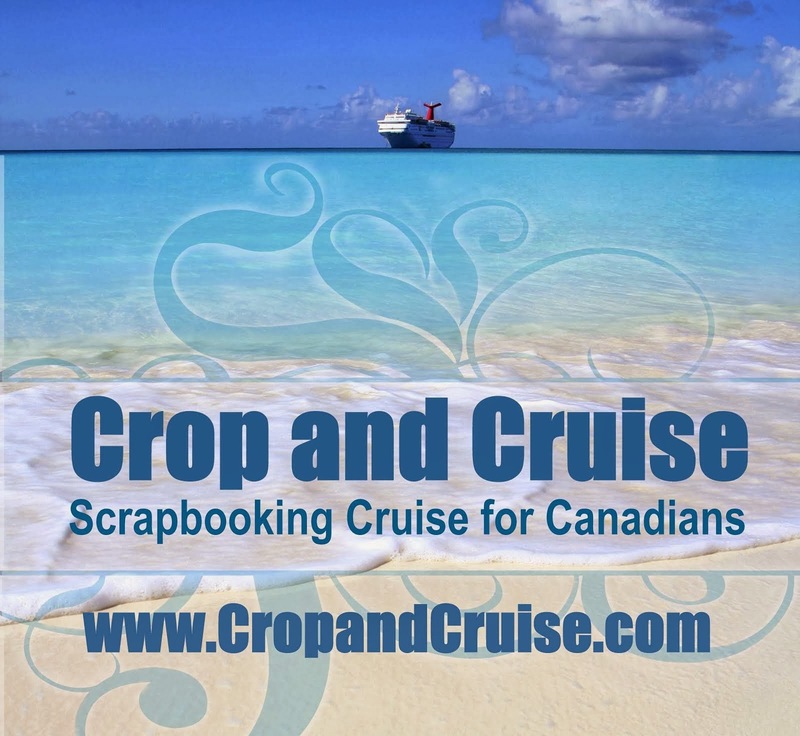 Crop For Haiti - Calgary results!! My team (Jennifer Reynard, Brenda Bedard, Marlene McCook) who so willingly jumped in to help out in so very many ways (and especially in the kitchen which is NOT my forte!). Michelle King, Heather Rambow and Jennifer Reynard for designing and teaching, and ALL my volunteers that helped out during the day including the "carriers", my hubby, sister-in-law Cindy and 84 year old parents!! And to all who donated Raffle Prizes, items for the Spin to Win, food and more!! And then of course, all our 54 attendees!!! "Together we can do this!" We spoke with Live Different this week and found out there are some immediate needs at the school they are currently working on (finishing the kitchen, obtaining a water supply, etc.) that might be part of the building project in July when Brad and I are planning to go (we also might start the art room too!!). So we will donate the majority ($4000) from our crop specifically to the Art Room fund and will reserve the remainder ($1779) for the immediate needs and building projects at the school during our trip in July (hopefully including some more ART supplies to teach ART again while there!!). This is the view of the school from behind over looking the ocean and the city of Cap Haitien below. As you can see, there is still a LOT of work to be done, but such progress is so great to see!! 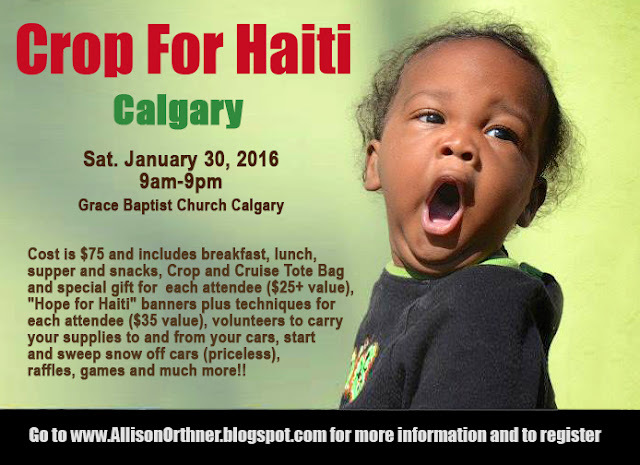 Join us for this year's annual "Crop for Haiti" event in Calgary on Saturday, January 30, 2016!! 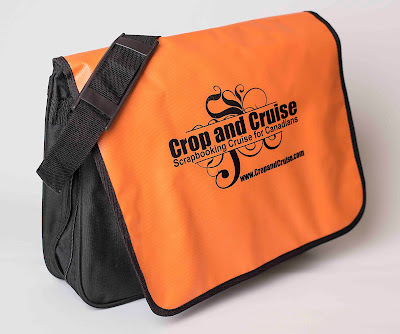 Cost is $75 and includes a light breakfast, lunch, supper and snacks, a Crop and Cruise Tote Bag with special gift ($25+ value), "Hope for Haiti" flag to decorate including techniques ($35 value), volunteers to carry your supplies to and from your cars, start and sweep snow off your car (priceless! ), raffle prizes, games and more!! Event will take place in the gymnasium at Grace Baptist Church located at 2670 Radcliffe Drive SE from 9am-9pm with plenty of space to crop! 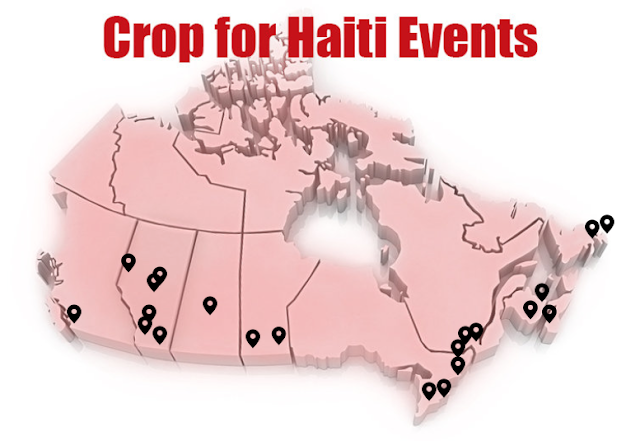 This crop is part of the "Crop for Haiti" events taking place across Canada to raise funds for the school in Haiti we are helping to build! Space is limited so register soon!! Bible Art Journaling - How to get started!! 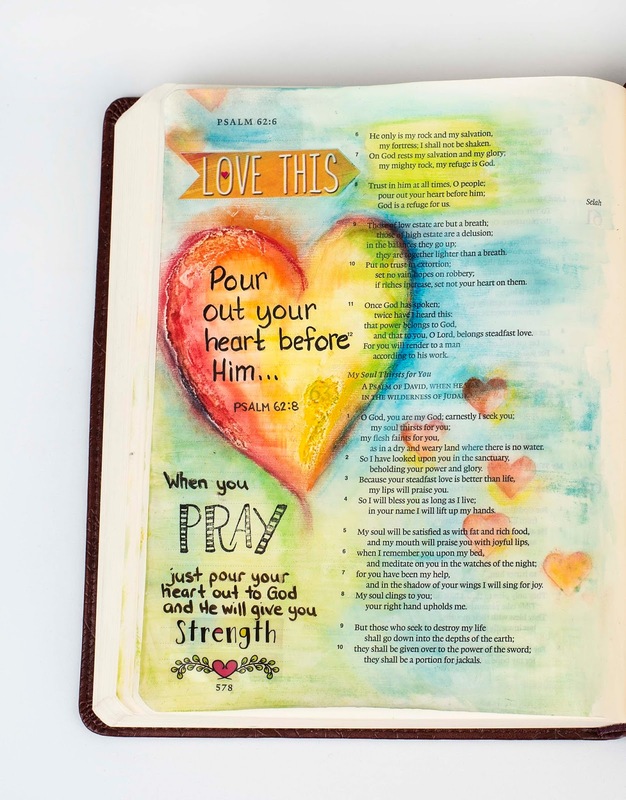 Christy: (while chatting on the phone) I keep forgetting to tell you about Bible Art Journaling! Allison: What's that?? Sounds interesting!! 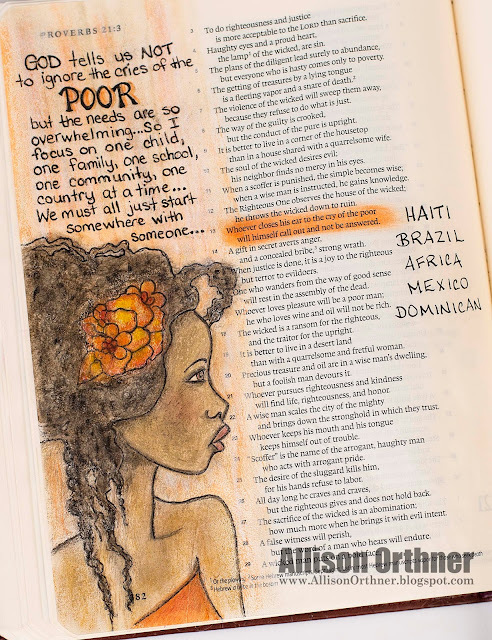 Christy: People are doing art journaling right inside their Bibles. Google it. Allison: (Googling) This is soooo cool!! This is so me!! Christy: I thought you'd like it! 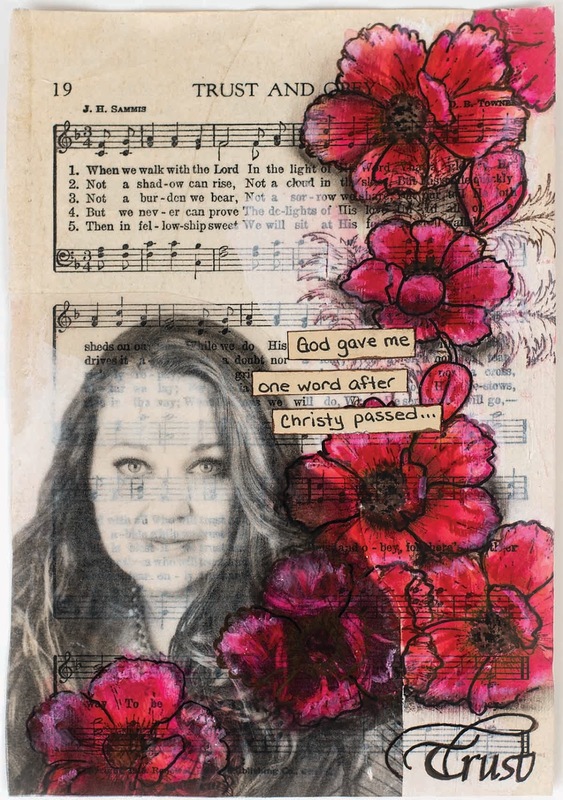 And I thought we could do it together... you know the Bible and I know art!! 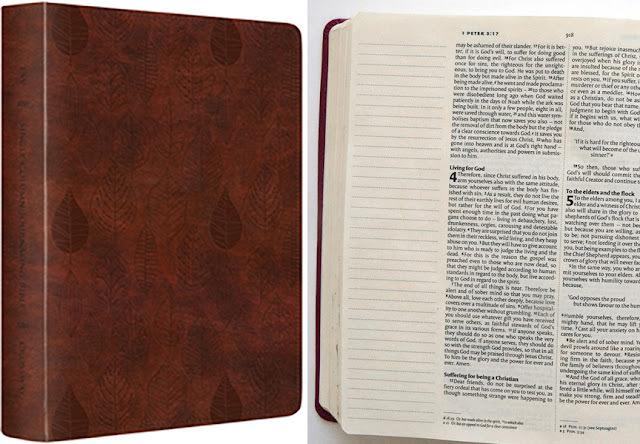 We (Christy Riopel and I) bought journaling Bibles from Amazon (ESV Journaling Bible published by Crossway) and did our very first pages together (above)... Proverbs 3:5... "Trust in the Lord with ALL your heart and do NOT lean on your own understanding." I can't begin to explain how many times this verse has helped me through my life. And I can't begin to explain how my heart is captivated by this new obsession!! Imagine... I can combine my faith with my art and recording my thoughts and life lessons all within the pages of one precious Bible!!! And I can even add photos!!! It's like my entire heart all in one place!!! 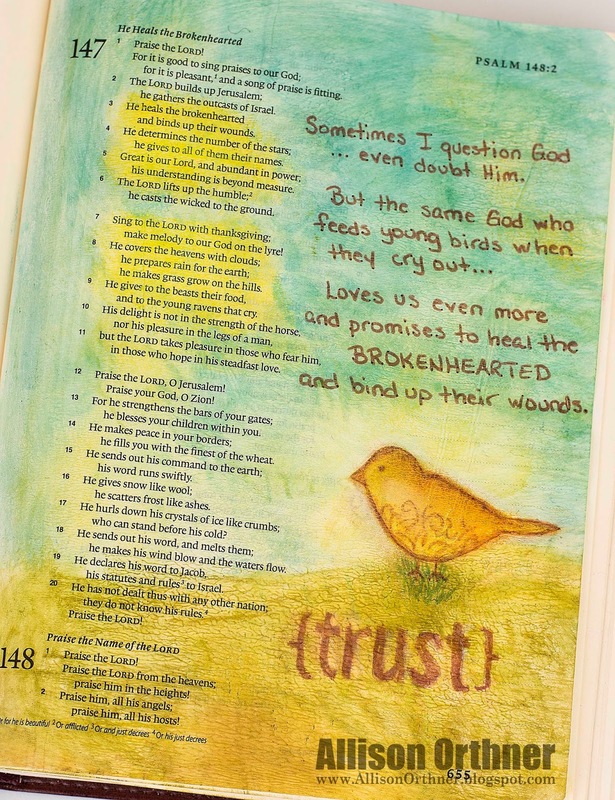 And Bible Art Journaling is growing around the world!! Some call it "illustrated faith" or "documented faith" or "creating in faith" (google those!!) and they can't seem to keep the Journaling Bibles in stock!! I think it's because so many of us are finding ourselves driven back into our Bibles in a new and creative way with this!! Q. What sort of Bible do you use for Bible Art Journaling? Q. What supplies do you need to get started? Once you have your Bible, you can honestly begin with just a pencil!! Most also use pencil crayons and gel highlighters and journaling pens that don't bleed through (I like Faber Castell Pitt Pens best and bought a set at Michaels). 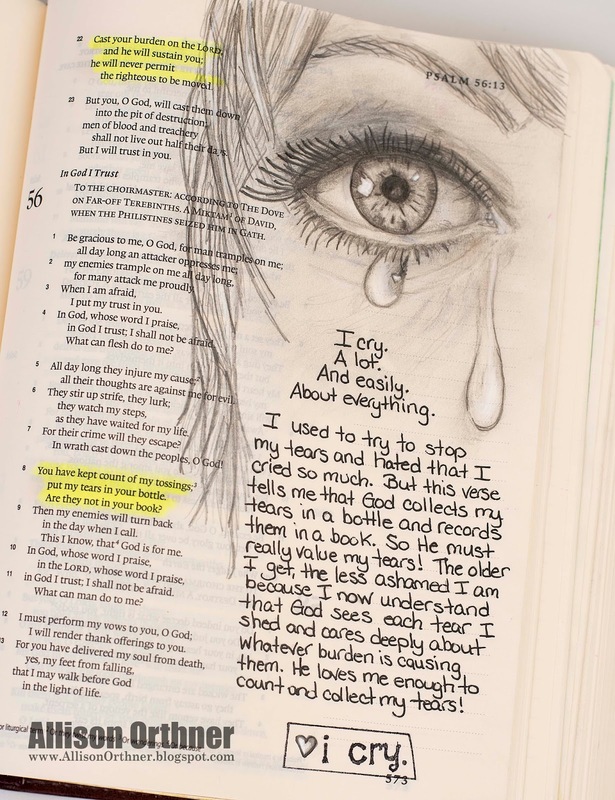 For this page I took a photo of myself, changed it into a drawing on the computer then replicated it in my Bible using pencils, added the tears (and fake eyelashes cuz I can!) 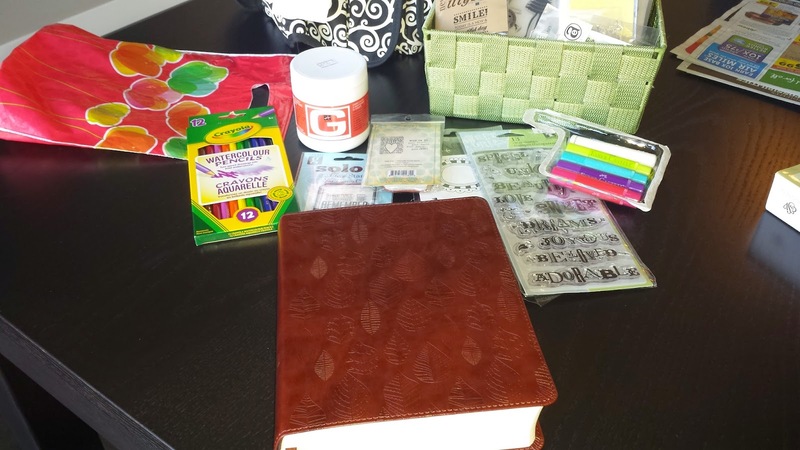 and then journaled. I LOVE it!!!! Q. Don't paints, inks, colours and pens bleed through to the other side of the thin pages? 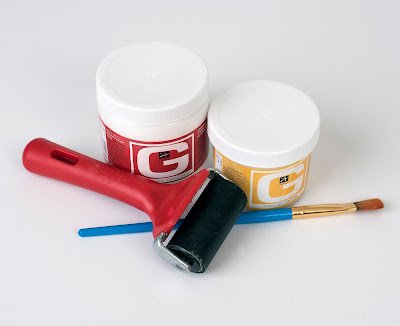 Depending on what you are wanting to do with your page, you might want to prep the page with gesso or a clear matte gel first (buy at any art store). 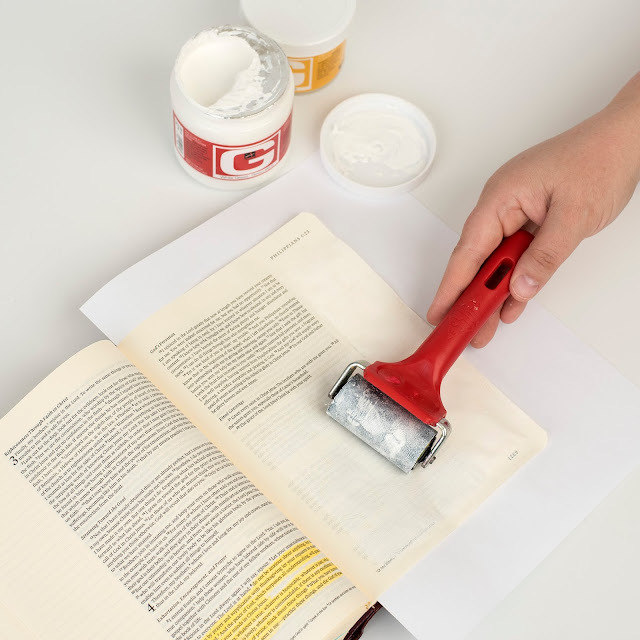 This not only seals the page and prevents bleed, but it also allows certain mediums to be better applied, blended and worked with. Well I think that's enough for today, but you HAVE TO get the Fall 2015 issue of Canadian Scrapbooker Magazine where Christy and I wrote an entire article that has 20 different page samples and explains in even more details how to get started with Bible Art Journaling and illustrating your faith right inside your Bibles!!! 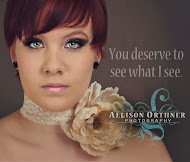 You can also follow me on Facebook and Instagram (click button on top of page) to see more work!! And if you have any more questions, please don't hesitate to ask!!! 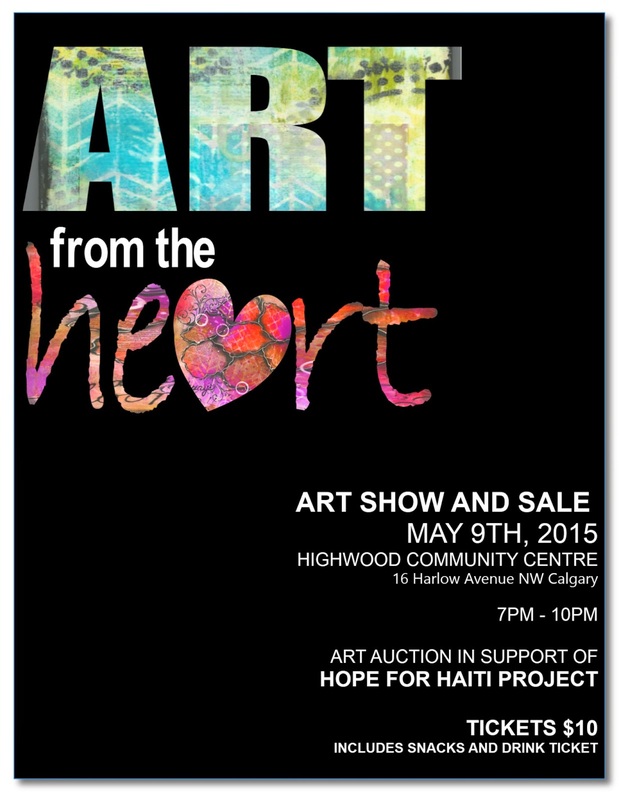 AND... you will have the opportunity to support a great cause... Hope for Haiti ART ROOM Building Project through a Silent Auction of items and the purchase of ART made by the actual students attending the school in Haiti! Come to the show to pick your own custom piece of ART!!! So I've been celebrating turning 49 for at least a week and I don't want it to stop. In fact, I think I'll just go all year in anticipation of a SUPER BIG celebration next year when I turn 50!! You see, going to Haiti puts ALL of life into perspective... and as I'm aging, I'm finding real clarity in what I want to do with my life and how I wish to spend my time, my energy, my strengths and talents, and my money. And high up on that list is continuing to help these precious children and the entire community in Haiti by continuing to build their school and bring water and food and healthcare and ART to them!! I've got some ideas for this next year and I CAN. NOT. WAIT. Meanwhile, know that my birthday plans involve YOU!!! Because together we can change our world. 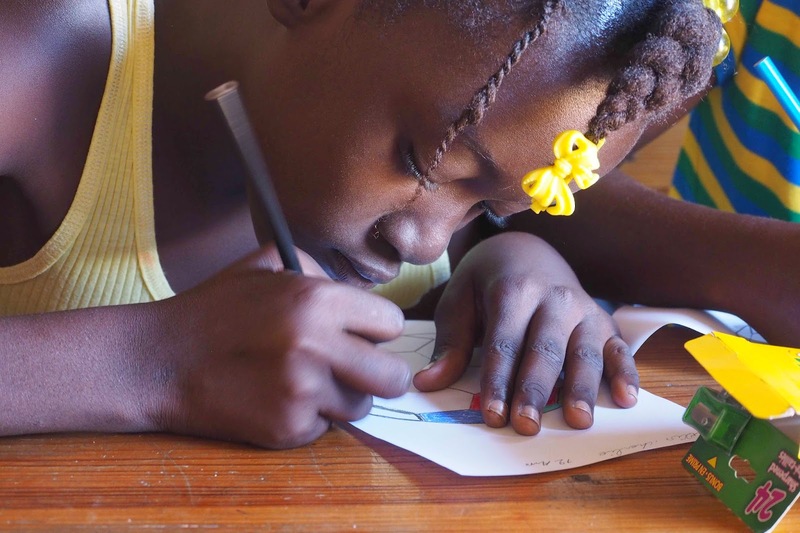 Short Haiti Story - "The Tarantula"
We are home from another trip to Haiti building a school there for some of the neediest people in our world. 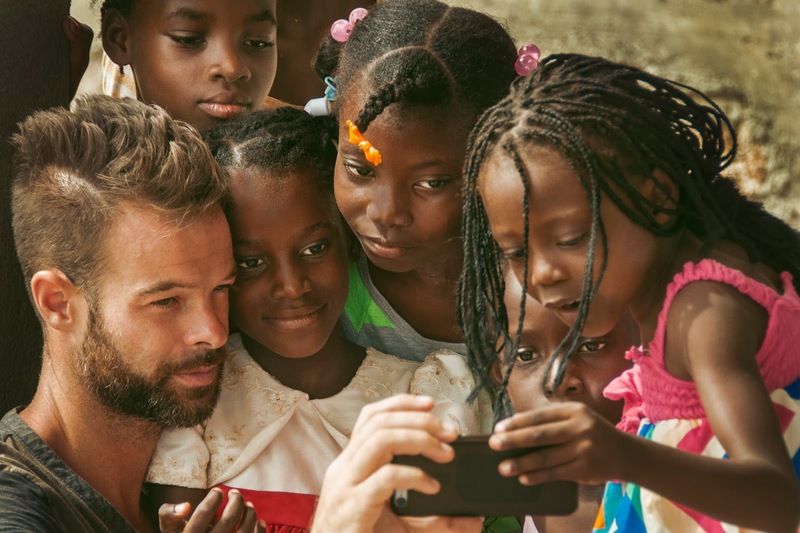 I have so many stories and photos to share so I'm going to break them into "short stories" from Haiti over the next several weeks. Enjoy!!! 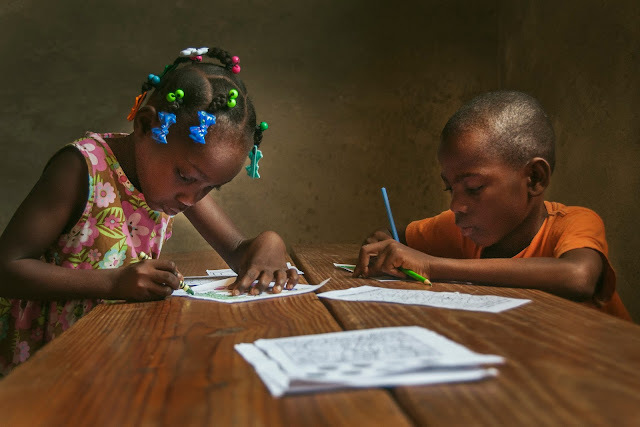 Last year in Haiti we worked with a group of construction workers at the school who didn't speak our language which made it difficult for us to connect. 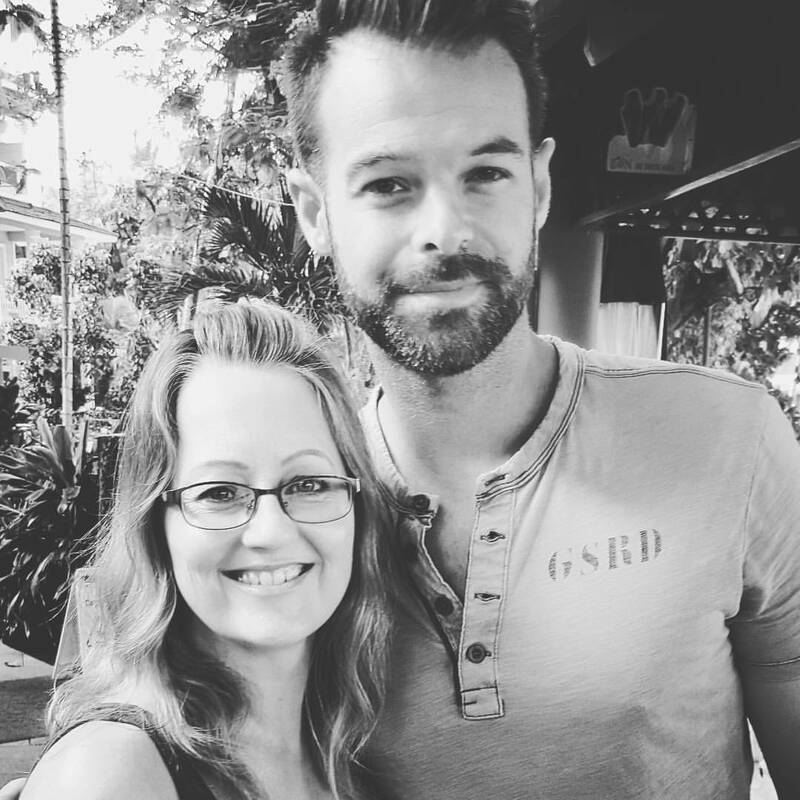 It wasn't until the end of our trip last year when they challenged us to a soccer game that we finally felt we made inroads into relationships with them... and then we left. Well this year, many of the same construction workers were there and we recognized each other and right from the get-go, there was a much warmer reception! 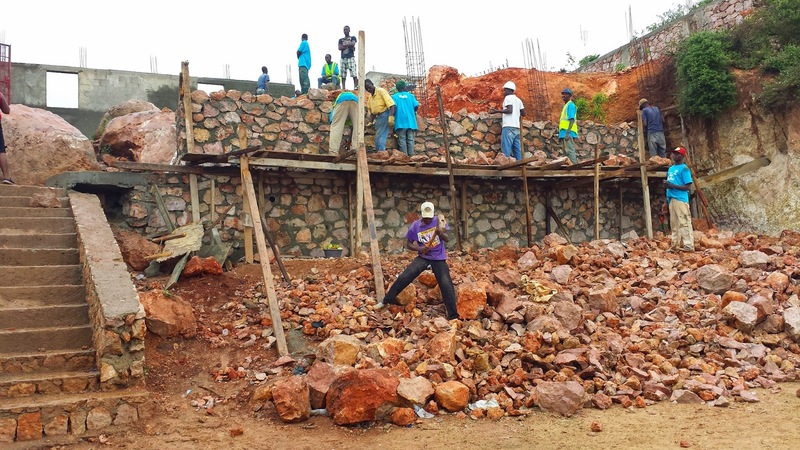 So the very first day we were working, I had tried to speak some Creole with a few of them while working and was moving a pile of rocks (there were a TON of rocks to move!!!) when we uncovered a TARANTULA!!! 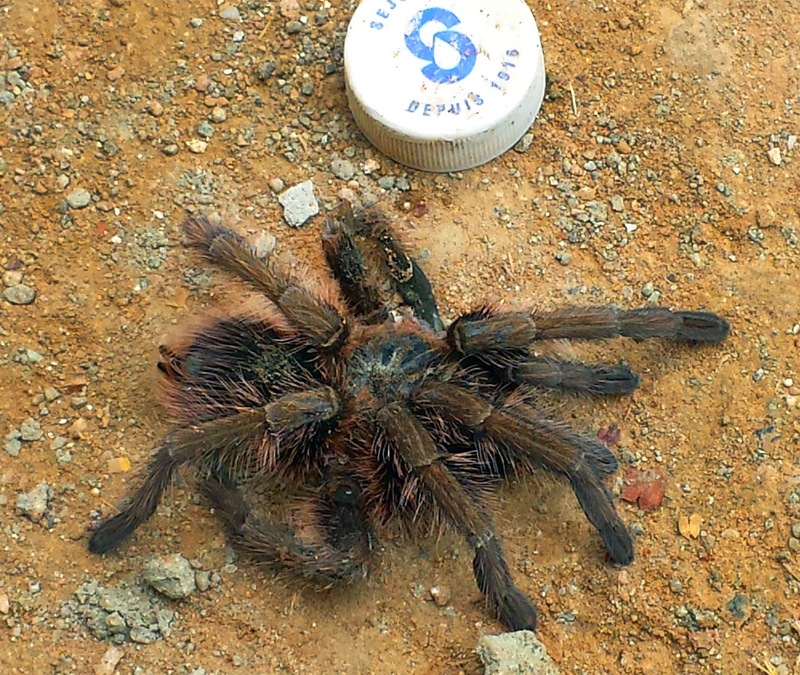 A big hairy live tarantula!!! What happened next is quite the blur, but I remember leaping in the opposite direction to where I thought the tarantula landed and have been told there was some screaming involved and I apparently hit the construction worker a few times!!! Oh and all the while I was desperately reminding myself to NOT DROP MY CAMERA as I jumped on top of loose rocks especially as I had NOT taken the time to put the strap around my neck. This was the highlight of my day and one of the best moments of my trip this year!!! You see, it was such a sure sign to me that the local Haitian construction workers welcomed us foreigners with open arms... what you need to understand is Haitians are used to being exploited by foreigners and strangers... they don't trust easily... they don't understand why "rich white people" would come to their country to work and pay to do it!! 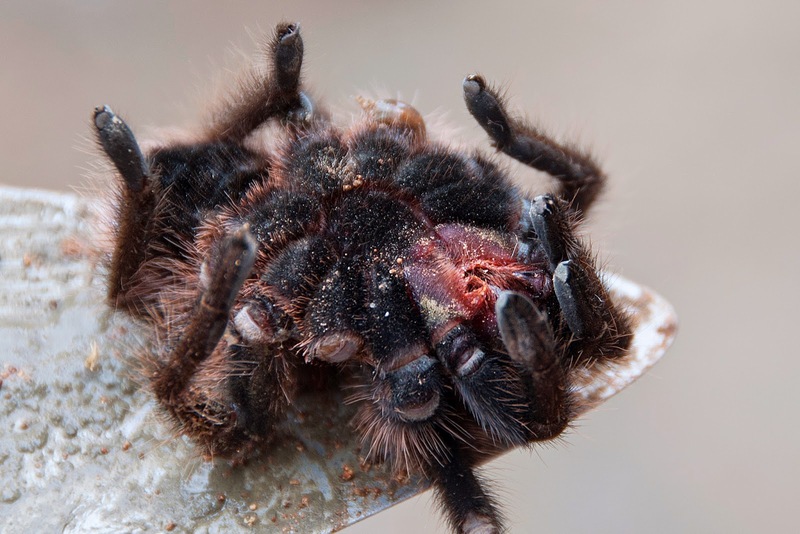 But because we had come last year and returned to do it again this year, they trust that we really do care... and they trusted us enough to have some fun and throw a tarantula at us (or me... but I like to think of it as "taking one for the team"). And that incident set the tone for the rest of the week... their acceptance of us was evident and it was pure joy to work along-side these men who work so very hard building this school for this community (part of our trip expenses goes towards paying their wages to work on the project with us). Stay tuned for more stories!!!! I'm sitting here with tears streaming down my face because I am just so full of HOPE right now. HOPE is something that I don't always feel… I watch the news and lose hope. I see so many of my friends suffering struggling and I lose hope. I see disease taking away loved ones and I lose hope. I walk into my laundry room and see mountains of clothing and lose hope (yup some days it is sadly just that simple). But this week I am full of HOPE. 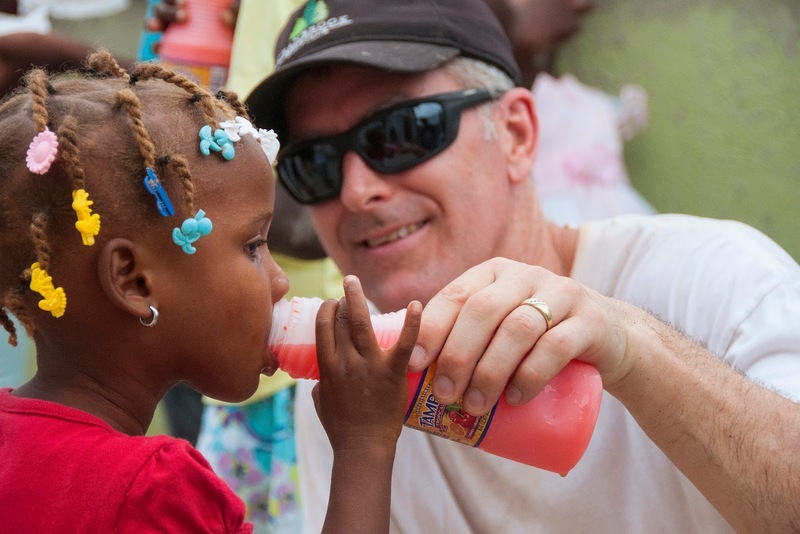 Live Different is the organization that I use to go to Mexico, Dominican and Haiti to build with and help change lives. I love them. They are Canadian. They are determined to help meet the most basic needs of some of the neediest in our world. WestJet is one of their biggest sponsors and this week a video has been flying around the internet… WestJet's "Blue Santa" went to the Dominican to the same community I was there building with and I recognize so many of the children!!! And WestJet has definitely built a LOT of homes in this community and now a playground I plan on playing on in February when I go back to visit… but I need to give a special call-out to Live Different and the people who have dedicated their lives to helping those in our world struggling to even have the basics in life… they along with companies like WestJet give me hope. 1. 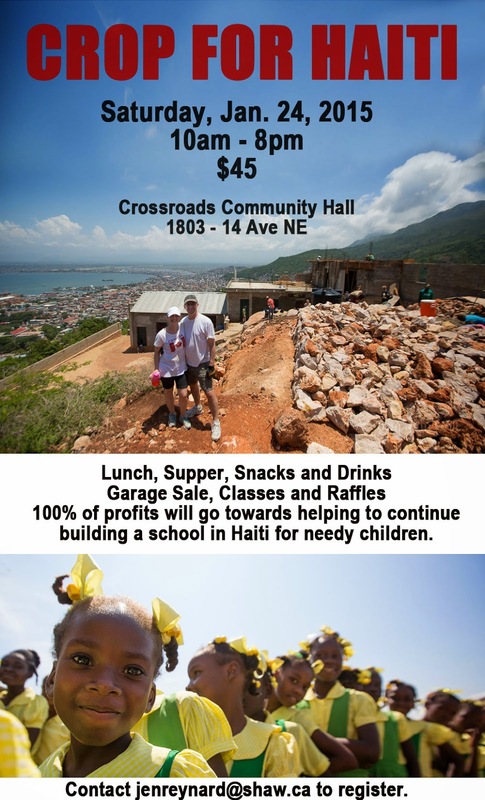 My good friend Jennifer Reynard (who has a heart of gold), is hosting one of her infamous crops here in Calgary and donating the proceeds to the trip in February where we will continue to help build a school there. This fills me with hope as this crop fills up. 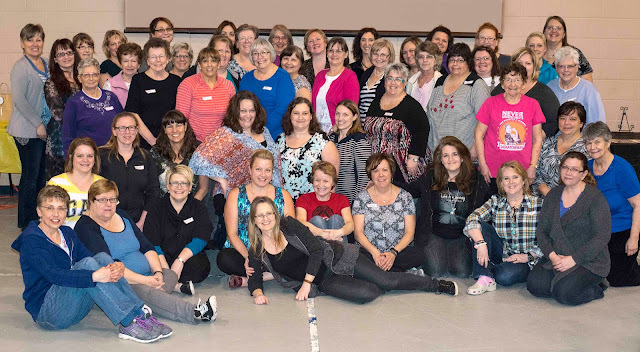 There are limited spots available so register ASAP if you would like to join us Jan. 24. 2. 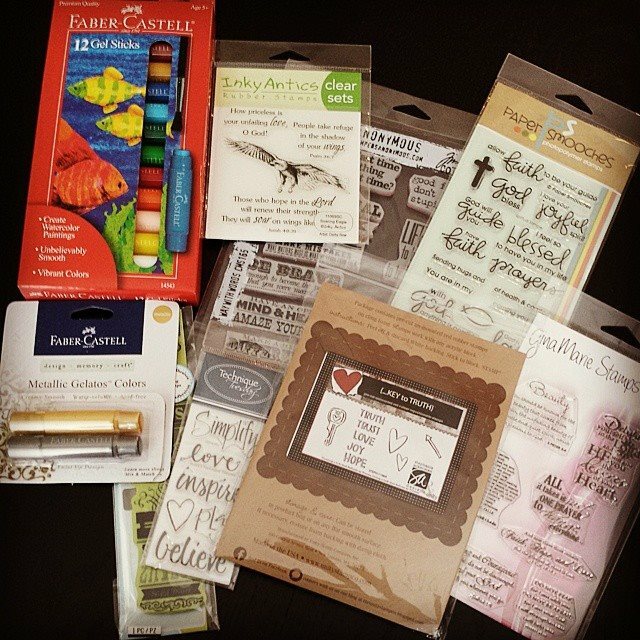 I am also doing an ONLINE AUCTION of mostly scrapbooking and crafting items, but also a few other goodies thrown in!! It started this past week and will pretty much run until it is either all gone or the Jan. 24 crop… whichever comes first!! 100% of all proceeds will go towards the Haiti trip and school so build generously and please SHARE!!! It is on Facebook HERE. 3. If you would just like to donate money, you can do that too!!! Anything over $20 is tax receiptable and the link to do that is HERE. And one more thing that just put a smile on my face this week and HOPE in my heart… I photographed a special lady… she wants to give her children the gift of a legacy portrait this Christmas… her and her husband have been married over 55 years… she understands that one day these photos will be precious… we had so much fun!! 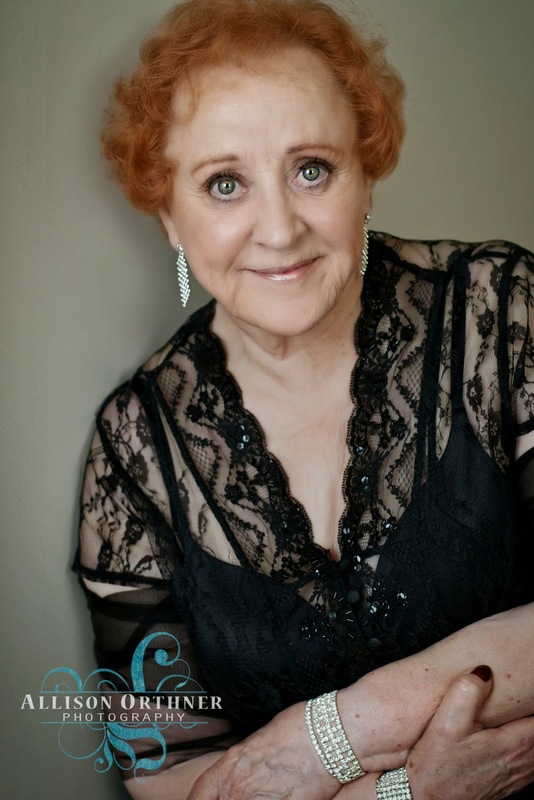 We added eyelashes and lip gloss and dressed her up in beautiful lace and sparkly jewels and we talked for hours about everything from marriage and how she met her husband to her favourite perogy recipe and fashion. 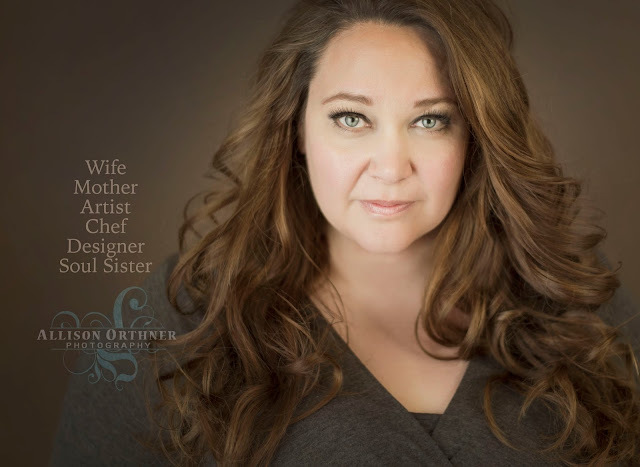 I know her children will see the beauty of this portrait and now I just pray that she will also see it as she is truly a beautiful lady inside and out. 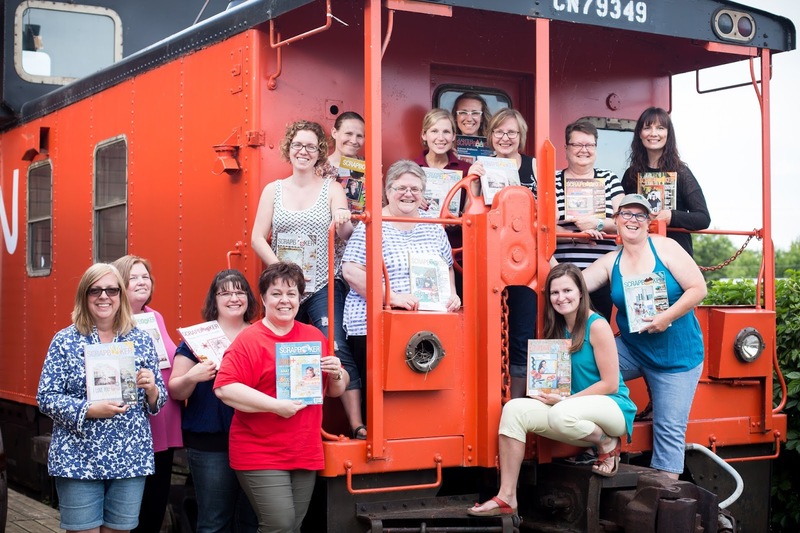 In case it isn't already obvious… I love what I do. 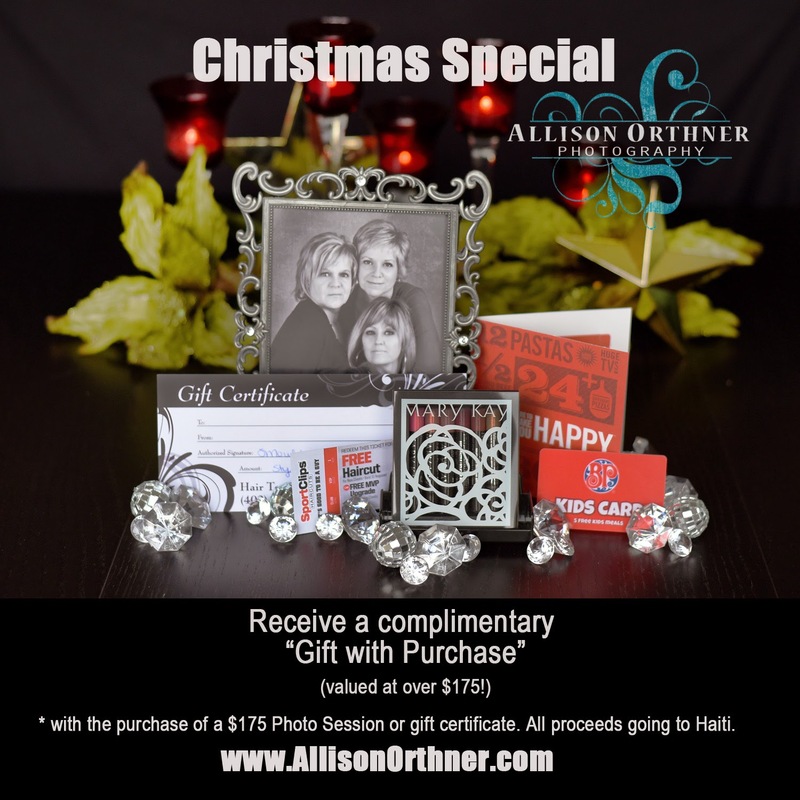 So with the purchase of a Deluxe Photo Session ($175), you receive a BONUS GIFT worth over $175 ($350+ value for only $175). And it all goes towards the Haiti school building trip in February. But HURRY as there are only 5 left!!! 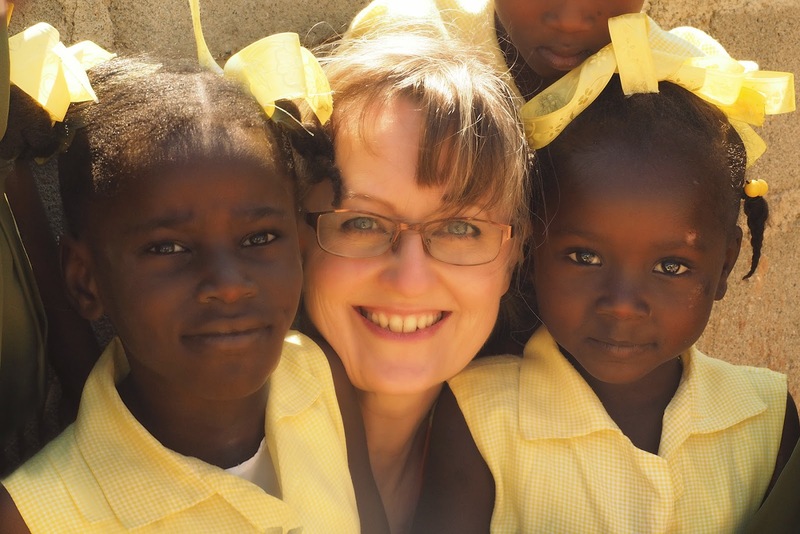 Oh my and ONE more way to help with Haiti… I am now a Mary Kay consultant and am also donating all my proceeds towards the trip from now until I leave in February so if you would like a catalogue or would like to put in an order, please let me know!! So as my teenaged kids are exploring assorted options for their future lives (especially Justin who is graduating this year), so I am re-visiting what I know to be true in life in attempts to help them make some important decisions on their journey… and I came across one of my favourite TED talks ever!!! I had seen this years ago, but it is worth rewatching (over and over again). "We need to see our children for the HOPE that they are… our task is to educate the WHOLE being so they can face the future and make something of it." So what do I REALLY want for my children on this earth? 1. I want them to love God with all their heart. 2. I want them to love themselves. 3. I want them to love others with as much passion. 4. I want them to find joy in a life of service to God and themselves and others. And so with that base firmly established, now the task is to discern how this will play out in the specifics of what they choose to do! Justin is graduating and Lindsey is in Grade 11 so some HUGE decisions are being made over the next short while!! Both have strong academics (especially in the maths and sciences… clearly not MY genetics! ), but both also have strong creative sides (I will lay claim to these genetics however) and strong athletic interests (from both Brad and I)!! So they could each go in so very many different directions!! But I'm excited to see where they end up and the last thing I want to do is kill their creativity in any way!! And speaking of creativity, I have some other exciting news!!! I found a NEW creative passion!!! Well, it's not a passion yet, but I sense it will become one!!! More later on that, but meanwhile here is a hint!! !